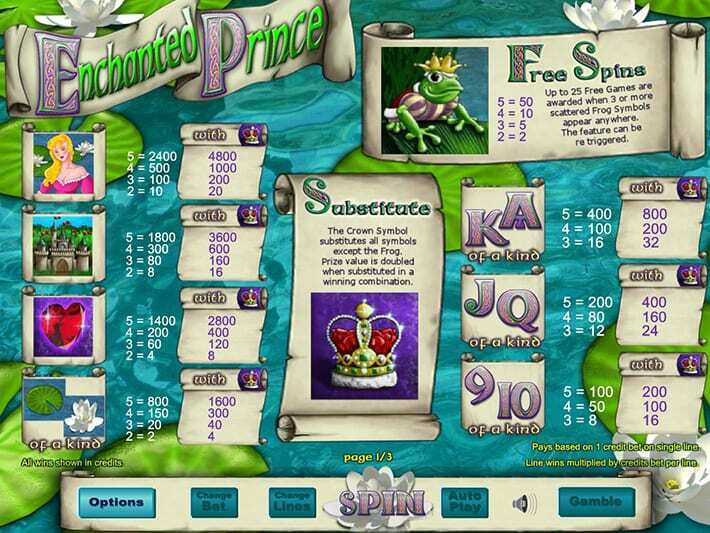 The frog prince is back and has turned his hand at developing a royal-themed online slots games of pageantry and pomp. Hop along with this majestic little toad and win yourself some cash with this 25 payline adventure. Ribbet! Most people will know the story of the princess and the frog as it is one of the most famous fairy tales in the world! Enchanted Prince slots take you on this magical journey as well as providing you with a stunning online slot gaming experience at the same time. Play slot games online and other similar ones today. If you are a new player then this is a game that will definitely give you an instant appeal. If you are an experienced gamer then you have no doubt come across this game before and know what it’s all about and that is what has tempted you back! This is an Eyecon game and has all the traditional traits that you would normally associate with a game from this developer. Namely: fun, simple graphics and a compelling overriding theme. They've already provided players around the world with hundreds of top quality games providing players with thousands of hours of fun and excitement. The game comes with 25 individual pay lines spanning the typical 5 reel, 3 row structure. As you’d expect there are some classic images and artwork from the story, and you’ll see in the background the pond with its lily pads and on the reels we have the princess, the frog, the castle etc. One of the best online slots available today, Enchanted Prince slots playing experience is pretty smooth and you can bet as little as 1p per line, making this an excellent entry level game if that’s what you’re looking for. The wild symbol is the enchanted prince crown and the scatter symbol is the frog prince. The wild will substitute for all other symbols except the scatter. An appearance from the crown will double your win! There are some generous bonus features that are generated by landing the frog price. There are some enticing multipliers available on your original bet. There is also a “gamble” feature that may lead to doubling up on your win and increasing the fun, but always be aware this is a risky option that can frustrate if it goes against you. 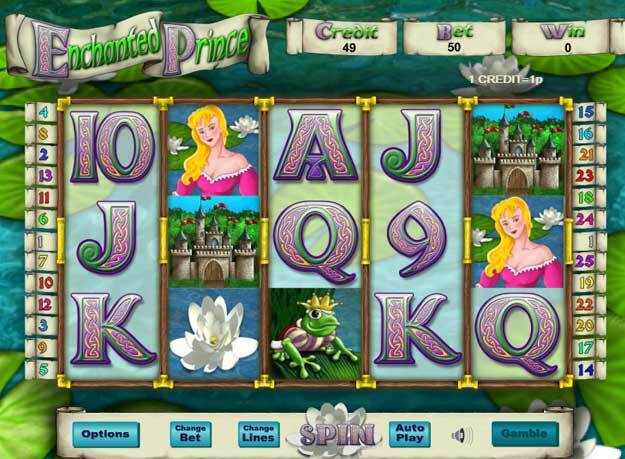 Enchanted Prince Slots is an uncomplicated but eye-catching game. The graphics and design will appeal to most people and there are some good bonus features to help you on your way to a big win. Even experienced gamers tend to come back to this game time and time again meaning that the rewards and the experience, on the whole, must be fairly compelling. This is one of our best slots and we hope you enjoy it too. If you like it then you should try Starburst too!